For most Americans, the cellphone is no longer an auxiliary or supplementary device to their landline telephone. Roughly nine-in-ten Americans own a cellphone and nearly two-thirds own a smartphone. Recent research from the U.S. government shows that almost 43% of adults live in a cellphone-only household – that is, without a landline. As mobile devices become more common and essential, Americans are creating and navigating new norms around these gadgets’ use in social gatherings and public spaces. Cellphones can be a source of instant connection — and constant distraction. Many are concerned that people’s attention to mobile devices in public and in social spaces prompts them to live “Alone Together,” as the title of MIT professor Sherry Turkle’s book puts it. Such a life, in her view, is socially stunted and damaging to communities. On the other hand, researcher Keith Hampton, who has studied how people use mobile devices in public spaces, has found evidence that cellphones are not encroaching on group social interactions, but rather are serving to fill time during periods of waiting and other interstitial moments. These are intriguing and important issues. Norms of etiquette are not just small-scale social niceties. They affect fundamental human interactions and the character of public spaces. That is why Pew Research Center conducted a survey on the subject. The poll found that Americans have varied and nuanced views on the new contours of civil behavior. They are sorting through the neo-etiquette of mobile life — sometimes attesting that constant connectivity brings social payoffs and other times lamenting what screen distractions do to social gatherings; sometimes appreciating the instantaneous availability of people and information and other times feeling aggrieved when others want to take advantage of that; sometimes declaring the importance of being present with others and other times glancing at screens while in-person conversation swirls around them. This chapter starts to explore these cross-pressures with a look at the basics of “always-on” connectivity. Fully 92% of American adults own a cellphone, including the 67% who own a smartphone. As cellphones and smartphones become more widely adopted and play a larger role in people’s daily communications, their owners often treat them like body appendages. Nine-in-ten cellphone owners1 (90%) say they “frequently” carry their phone with them, while 6% say they “occasionally” have their phones with them. Just 3% say they only “rarely” have their cellphones with them and 1% of cellphone owners say they “never” have their phone with them. Though the vast majority of members of all age groups carry their phones with them frequently, there are still some differences by age. For instance, cellphone owners ages 30 to 49 are more likely to have their cell phone with them frequently (95%) than any other age group; cellphone owners ages 65 and older are least likely to carry their phone with them frequently (81%). Beyond that, the majority of cell owners almost always keep their phones on. Most cell owners say they turn their phone off either rarely (45%) or never (31%). Cell owners under age 50 are most likely to say they never turn their phone off, and cell owners ages 65 and older are most likely to say they frequently do. 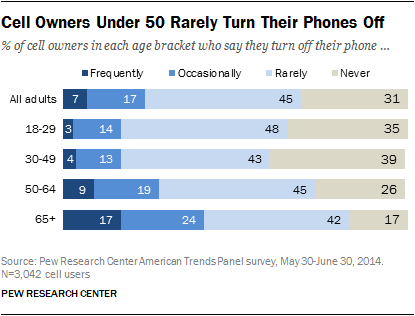 Still, over half of these older adults still say they rarely or never turn off their phone. Most smartphone owners say they rarely (47%) or never (36%) turn their phones off. Just 4% of smartphone owners say they turn their phones off frequently, and 14% say they turn them off occasionally. However, “feature phone” owners (those who do not own smartphones) are more likely to turn their phones off at least some of the time: 16% say they turn them off frequently and 24% say they turn them off occasionally. Still, a majority still say they turn their cellphones off either rarely (40%) or never (20%). Those who own smartphones are more likely than other mobile phone users to have their phone with them and powered on. Some 94% of smartphone owners carry their phone with them frequently and 82% say they never or rarely turn their phones off. Web browsing is somewhat less intense in usage: most smartphone owners browse the web on their phones at least several times a day, although only 14% use their phones’ browser continuously (roughly half the proportion who continuously use apps). As with many other technology-related activities, there are substantial differences between age groups. Younger smartphone owners use apps and browse the web on their phones more often than older adults. Some 43% of smartphone owners ages 18 to 29 describe their app usage as “continuous,” compared with 26% of smartphone owners in the next highest age group (ages 30 to 49). Meanwhile, among older smartphone owners, just 7% use apps on a continuous basis and about half (48%) of those 65 and older say they use apps on their phones once a day or less.